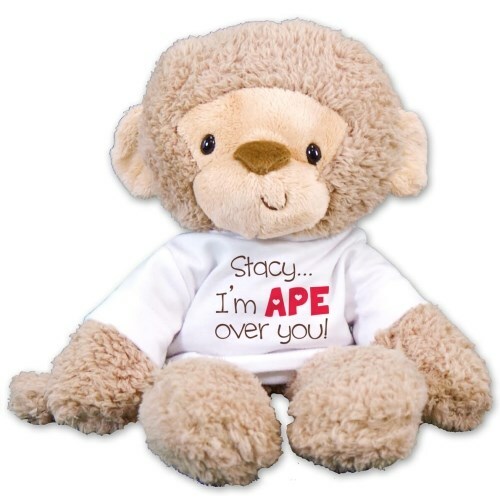 I'm APE Over You Monkey - 14"
so cute, the coloring was great and so soft. The adorable look on this monkey's face says it all! You are completely APE over your sweetheart! Celebrate your next romantic occasion with this monkey and watch them fall completely in love with you, over and over again. Our romantic design is featured on the Fuzzy Monkey from our Gund collection. Fuzzy features plush tan fur and is extra floppy with a plastic bean stuffed bottom and paw tips for extra weight. He measures approx. 14” tall and includes free personalization of any name. Just simply follow the steps below to start creating your unique gift idea. Free gift wrapping is included to create a thoughtful presentation. GreT item. Bought it for my wife for Valentines day, and with it being her favorite animal, she immediately made it her new baby. My grandchild is getting this for Valentines Day. It Seems well made and is Really cute. Additional Details Shop for cute plush Valentine's Day gifts and romance bears at 800Bear.com and find the one that best fits your needs!